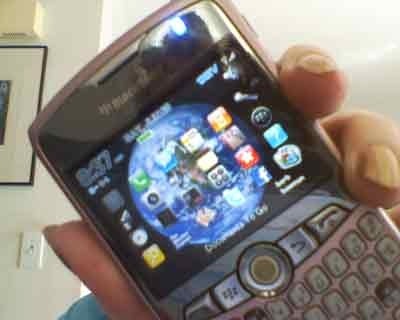 My personal cell phone these days is a Blackberry Curve 8330 (yeah, it’s pink). Mostly because it is the twin on the one I was issued at work so I don’t need a whole different set of accessories (desktop charger, cables, etc.). I actually like the device alot. Email on the go for sure keeps me uber connected, but I’ve only enabled a few of my email addresses for this. I resisted getting a smart phone for a long time, but now I don’t know how I managed without one. One thing that I didn’t like was the default theme pack offered by Verizon. But there certainly is a large variety of user designed theme-ware to be found online. 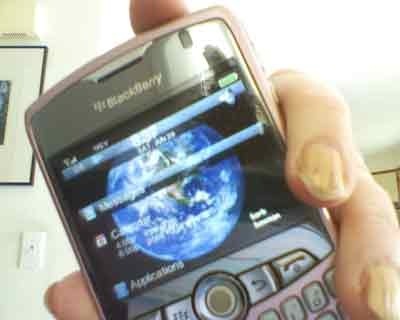 The iPhone like bBerry theme caught my eye, mostly because of the Blue Marble shot of Earth and the clean, Zen iPhone iconography. I customized it even further by adding a wallpaper (just like the one that comes with the theme itself) with my name on it (Photoshop, how do I count the ways). I like the “Today” default view. This entry was posted in Uncategorized and tagged bBerry, Blackberry, iBerry. Bookmark the permalink.